The time for less technical post came. This one is for you just to watch and relax. It is a list of our favourite surf movies with trailers so you can decide which one you want to watch. We are pretty sure you will know all of them soon by heart. Some of the movies listed here are absolute surf classics and some are slightly less known. We have enjoyed watching them all and hope you will as well. If you think we are missing a good one from the list please add it in the comments, so other people will get to see it too. In the last video tutorial we have learnt how to wax your surfboard properly. This time we focus on how to remove wax from your surfboard. You will need to do it form time to time for example when the wax layer looks pretty dirty or you going to travel and do not want scrub melted wax from sides of your surf bag or worse the clothes that you have put inside. Here we tell you how to take it off. Happy watching! So you had couple of surfing sessions and decided that surfing is the best thing you can do in your life. 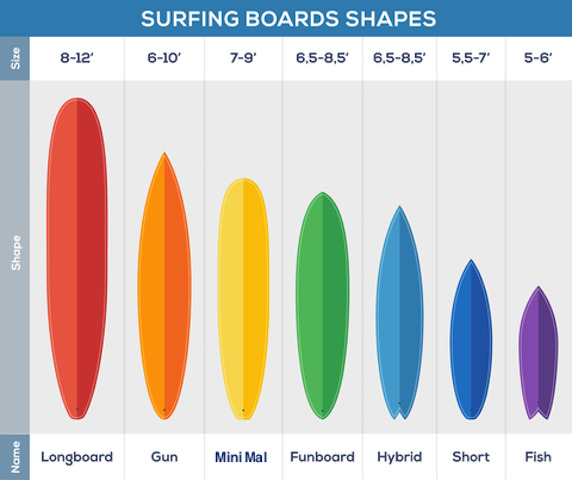 You are ready to buy your first surfboard and now comes the question: which surfboard type should you choose? Ideally you want a board that will be easy to learn on but you will not outgrow too quickly. We all know that shortboards look really cool and are easy to carry to the beach, however this will probably not be your ideal first surfboard shape. This type of boards are usually quite wobbly and do not catch waves easily. You want exactly the opposite. 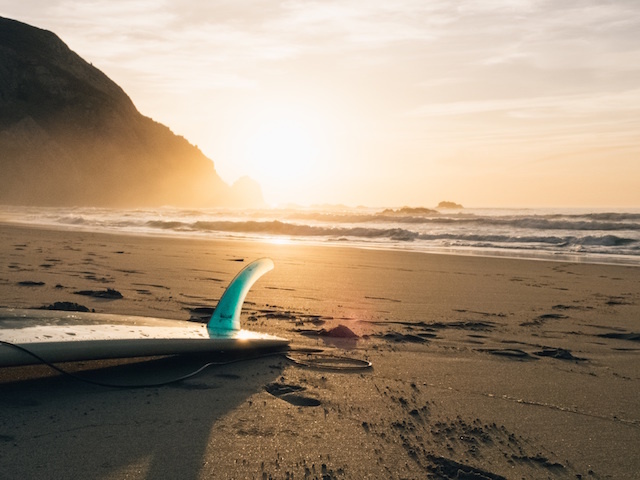 Below there is a list of desired characteristics for your surfboard that will allow you to catch a lot of waves even if you are not a Pro yet. You want your first surfboard to be long, something around 7-9 feet. The exact length will depend on your weight. If you are a girl of around 50 kg, 7 feet will be probably enough. If you are more towards 100 kg bound go for a board of around 8-9 feet. Another factor to take into account when choosing a board is storage and transportation. Some public transport will not allow you take items bigger then some predefined dimensions. For example London underground says they will not allow anything longer then 2m (slightly less than 6'8). We have taken longer boards on the tube and it was all fine, however you must take into account that you may be refused an entry. Similarly some airlines have length restrictions for the boards. A good compromise is to go for as long as you can but keeping those restrictions into account. You want the nose of your board to be rounded. The reason for this is that the more rounded nose the more volume is in front of the board and this allow you to catch the waves easier. We will talk more about volume later. From this point just remember that you want to avoid sharp pointed noses and look for the round ones instead. You want your board to be wide at least 20-21" inches wide. Ideally in the higher range of this or even more. Wide board will give you more stability and it will be easier to stand on. It will also be less wobbly when paddling. This is all good and will help you not to fall of the board so easily. If your board has the last three characteristics from above (long, rounded nose and wide) there is a high chance it has a lot of volume already. In general the volume measurement tells you how well the board will float on the water. Usually the bigger surface of the board the better it floats. The reason why you want your board to float well is because when you paddle on it it, the board and some pieces of your body are submerged in the water and they create drag. At the beginning you want this drag to be minimal so when you paddle you can move fast and just glide above the water. Faster paddling will have two benefits. First of all you will get to the line up faster and avoid being smashed by another set. Second of all it will be easier for you too match the speed of the wave when you paddle for it so you will not miss it. More volume will allow you to catch more waves and will definitively improve your wave count. For lighter people around 50 kg go for at least 40-45l volume. If you are more towards 80 kg bound you need something at least 50-60l or more. This are the sort of minimums you want and remember that usually more volume will get you more waves at the beginning so try to go as high as you can. A lot of beginner boards are made from epoxy. They are more durable and harder to ding. As a beginner you will fall of your board easily and will be more awkward carrying your board to the break, through the doors etc. Basically you will probably hit your board quite often initially. Therefore if you have a choice epoxy could be a better option for the first board. Otherwise fiberglass boards will be good as well just more fragile so you will need to be more careful with them. At the end I would like to add that that we have described here the ideal beginner surfboard. This however does not mean you will not learn to surf using a shortboard. In fact I know people that started learning on shortboards (that includes me to). This however is much more frustrating process and will take longer to learn. This is because you will not get as many waves as you would on a bigger board and balancing on it is also more difficult. This means you will have less time to practice your skills while on the wave as most of your time you will spend paddling and trying to catch the waves or falling of the board. However if you have enough determination, you are not giving up easily and the only board that you can use is a shortboard of your uncle stuck somewhere in the garage then go and do it. You will enjoy the process anyway. Today we are publishing a video explaining how to wax your surfboard. It is important to wax your surfboard properly so you do not slip when you finally catch a wave. All parts of the board that come in touch with your body should have some wax on it. This includes part of the deck where you place your feet and hands on. The last thing you want to do is to slip when you are popping up or already riding a green face of the wave. This video will explain how to wax your surfboard so this does not happen. So you have just started your adventure with surfing. You are probably overwhelmed with all kinds of board there are on the market. All this different sizes and shapes. This blog post will try to put some light on what is out there. This is the only surfboard type that is not on the graph above. This is because it can have different sizes and shapes and it is rather the material than anything else that differentiates it from other boards. 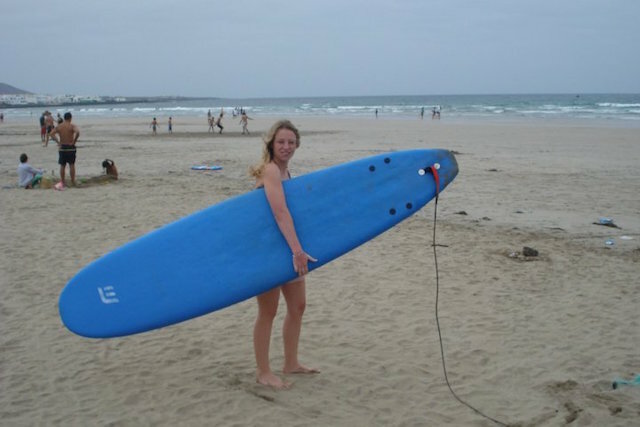 The top of the board is covered by a soft material therefore they are more friendly and safer for beginner surfers.This is the type of board that most people will have their first lessons with. Usually people will start on a large foamie (8-9 feet) and go down to smaller sizes. It is not only safer but also more floaty than traditional surfboards so it will be easier to catch waves. It is also popular with kids. This is the most traditional surfboard shape and has been there for longest. These boards are really long as the name suggest (9 feet and more), quite wide, have rounded nose and are very floaty. They will catch waves easily and are stable to stand on. They will be a natural progression for a surfer after he has learnt to ride a foamie. They usually have a single fin set up. These are similar in shape to a longboard but slightly shorter (7-9 feet). They are still quite wide therefore very stable. They will be more manoeuvrable that a longboard and still catch the waves quite easily. There are good boards for a surfer who is already comfortable with a long board and would like to progress to a shortboard in the future. 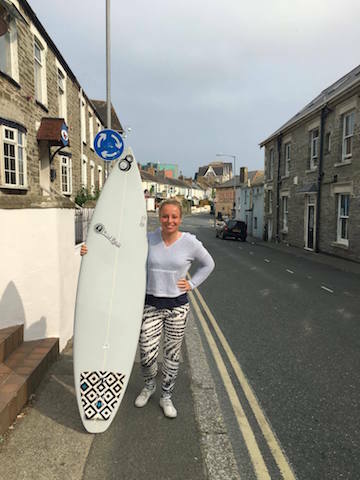 These type of boards are usually used by more experienced surfers and you probably now them from modern surf competitions. They are shorter then minimals (5-7 feet), narrower and their nose is pointy. This allows to do tight and radical turns on the wave. 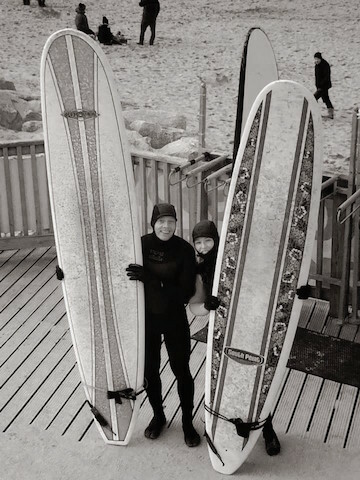 As these boards are not very floaty it will require stronger paddling to catch a wave. These are usually a mixture of the minimal and a shortboard. The idea behind is to keep larger volume of a minimal but allow for more agile turns while on the wave. The nose of the board is more pointy than the one of minimal but not as pointy as the shortboard one. They are wider than a standard shortboard to allow more stability on the wave. This boards are short and very wide almost from the top to the bottom. Their nose is still pointy but goes wide very quickly (almost at the top of the board). They have a very small rocker that allows them to gain a lot of speed on the wave. They often have swallow tail and quad fin setup. In Europe they are popular summer boards as they allow to have a lot of fun in smaller surf. This are usually a cross between a wide floaty fish and classic performance shortboard. The idea behind it is to keep the larger volume of the fish and its flatter rocker (allowing more speed on the wave) and combine it with manoeuvrability of the shortboard. This boards are narrow, quite long, have a very pointy nose and a lot of rocker. They are used for big wave surfing.